Heat oil in a nine stick pan, add cumin seeds and sauté till lightly browned. Cut thin batons of potatoes. Add the ground paste to the pan and sauté till lightly browned, stirring frequently. Add potatoes, salt and turmeric powder and mix. Add ¼ cup water and mix well. Cover and cook till potatoes are almost done. 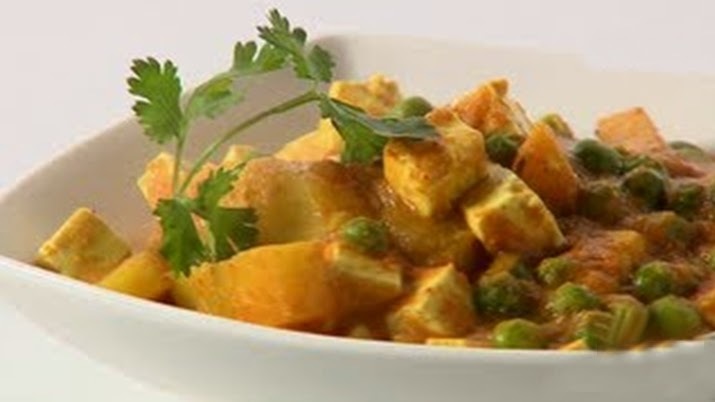 Cut paneer into small cubes. Add coriander powder and red chilli powder and mix. Add green peas and mix. Cover and cook till the vegetables are done. Add tomato puree and mix. Cover and cook for 2 minutes. Add peanut paste and mix well. And paneer and mix Sprinkle garam masala powder and serve hot with roti.